Asustek has announced a new version of the 8.9″ Asus Eee PC 901. They are adding 3.75G HSUPA mobile broadband internet connectivity to the Eee PC lineups, with the 901 being the first (and possibly only one so far). Users should see download and upload speeds of up to 7.2 Mbps and 2 Mbps (dependent upon location and carrier). This should free up a lot of people in remote areas or who did not have access to normal wireless hotspots. 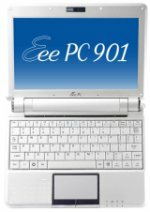 The Eee PC 901 with 3.75G will be available starting in October 2008. The models will be running Windows XP Home, with 6-cell batteries, and 16GB or 20GB SSDs. This entry was posted in Announcements, ASUS, Intel Atom, Netbook, Networking, News. Bookmark the permalink. ← MacBook Changes in October?